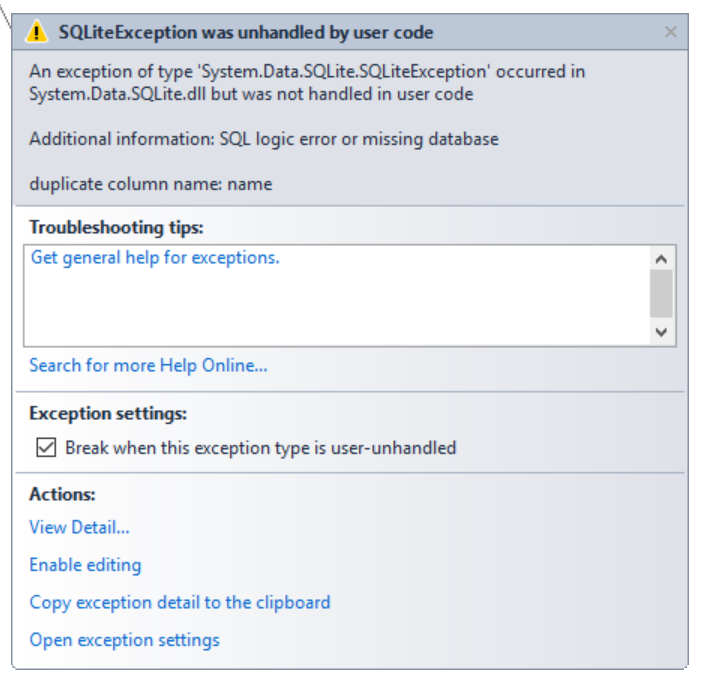 I'm getting the following error when I try to extract from the LasVegas3857.sqlite sample file. I get the same error when I try the whole-world file (WorldMapKit4326.sqlite) that we downloaded a year or so ago. 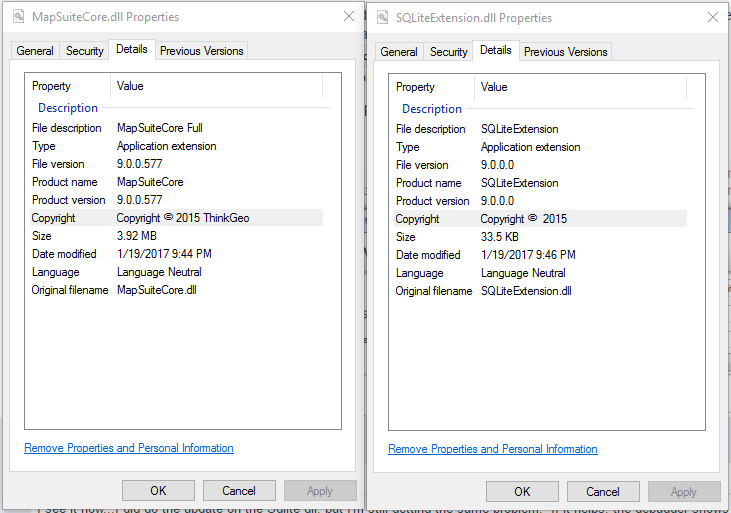 I'm using the MapSuiteCore and SQLListExtension from the full production files (version 9.0.0.577). That should because the data version don't match your dll render logic version. Please contact your sales to get the latest database, then try that again. I downloaded the latest database but I'm still getting the same error. I'm running the extractor I downloaded from here: http://wiki.thinkgeo.com/wiki/_media/file/world_map_kit_sdk_editionsample_osmworldmapkitextractor_cs_150226.zip (the actual file name is world_map_kit_sdk_editionsample_osmworldmapkitextractor_cs_170413.zip). Is there something else I need to check? I tested it today, that works well in my machine. 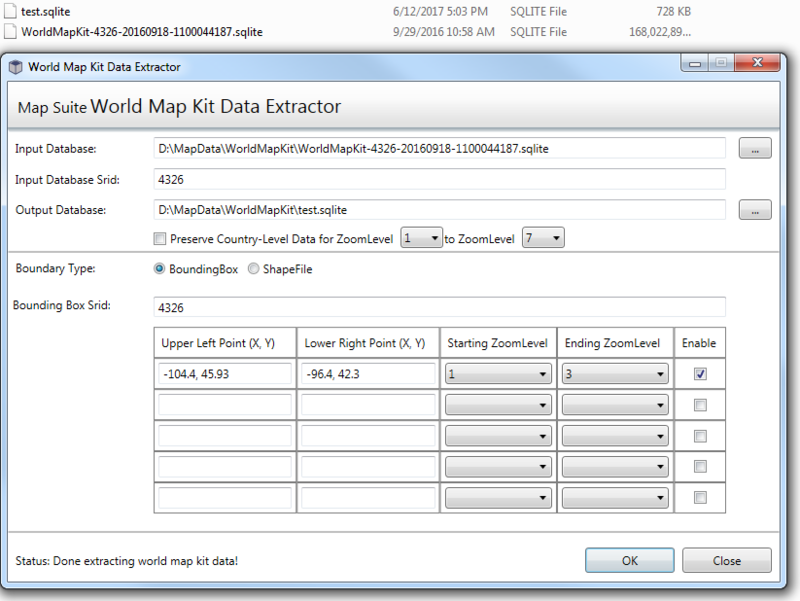 I downloaded the world_map_kit_sdk_editionsample_osmworldmapkitextractor_cs_170413.zip in your link, then modify all referenced dlls to 9.0.0.577. After that, I upgrade the Sqlite dll to latest from NuGet. You can see my data version is WorldMapKit-4326-20160918-1100044187.sqlite, I am not sure whether it's the latest version but it still works well. If you found any steps I missed please let me know. It may be the Sqlite dll that's out of date. What's the package name in NuGet for that dll? My test number is v1.0.105.2 from NuGet. Have you checked the information include my database version, zip file version, dll version? If anyone is not the same please let me know. I'm not sure which package I need to use from NuGet for the Sqlite dll. I did some searching but I don't think I've found the right one. You don't need to search the dll yourself. Those files are both in the same folder. I'm not sure if that matters or not, though. That's strange because I hadn't modified anything exception reference the dlls. I think I should want to modify the sample based on V10, so you can directly build it and the packages will download from NuGet automatic. Please try the sample as below, I modify the wiki sample to make that works with V10, and I tested it works well with the database WorldMapKit-4326-20160918-1100044187.sqlite. If that still don't works, please let us know, I think maybe we need a sample from you to reproduce that. It looks like version 10 did the trick. The extractor ran using the area I specified and the map looks great. I'll pass it along and make sure everything's ok for our users, but at this point it looks like we have a working extractor. Thanks so much for your help! I am glad to hear that's helpful.